The thought of removing an old driveway and installing a new one can be overwhelming. Of so many projects you can do around the house, to a homeowner oftentimes a driveway replacement can seem like one of the most expensive projects you can do. 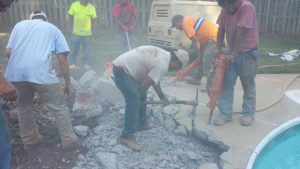 Thankfully Baja Concrete has perfected this art and remains one of the most competitively priced concrete contractors in the Charlotte Metro area. The key to removing old concrete is having the correct equipment and operators. Baja Concrete prides itself in being one of the most efficient and cleanest companies that you could hire for demolition projects. We understand that a concrete job is never one size fits all and that each customer has a unique situation that we need to properly address. Many times our customers are very surprised to see how quickly and efficiently we complete a demo replace job. This is very important to most homeowners and contractors who are trying to avoid living with a muddy or dirty driveway or patio for an extended period of time. The bottom line is that it pays to get a professional opinion on which direction to take when addressing your concrete needs. I have seen customers get sick to their stomachs when they find out that they spent more money for a shoddy repair job than i would have charged them to replace the entire driveway. Contact Baja Concrete for a FREE Estimate to replace your driveway with a 2-year warranty today! Baja Concrete Workers breaking up an old pool deck.